this was posted on my old blog back in 2007. it's a project i love though and it's a fun way to create a handmade present, so we thought we might share it again! Okay, here they come. 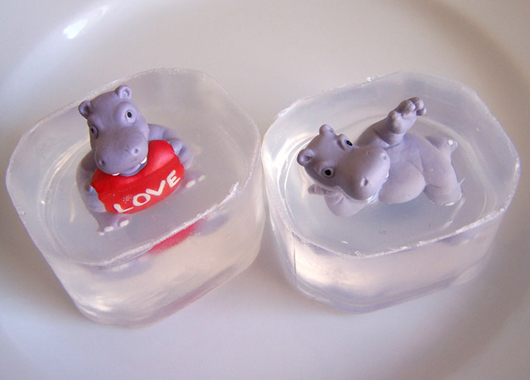 It's the wedding anniversary of my cousin and her husband today and when I asked them what food I should bring to the party, he answered: an aspic-preseverd hippo. 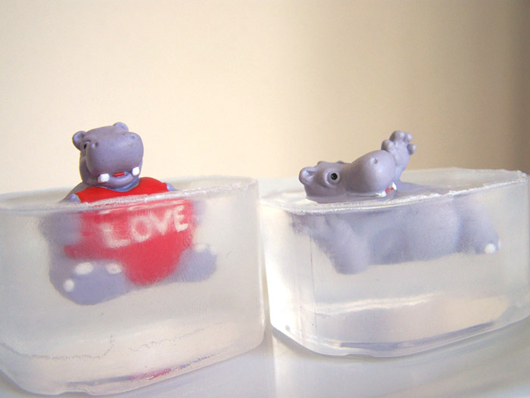 So I thought of how I might surprise them and bring something that looks like a hippo in aspic and came up with this idea: selfmade (glycerin) soap with plastic hippos (from the toys department) sitting in them. They don't wobble, but they're still quite cool! these particular ones were just made with glycerin soap, but the possibilities are endless!! you can add color or essential oils to get the scent you love. Thanks stopping by my blog. Your blog is full of fabulous ideas...I will be back for sure! Very cute idea! We might have to try this. My boys would love it and I bet my hubby would get into it, too. Do you put anything else in the soap? hi sarah! thanks for stopping by! these particular ones were just made with glycerin soap, but the possibilities are endless!! you can add color or essential oils to get the scent you love. make sure to stop back here and tell us about the results of your soap-making endeavors! !